KIITEE 2019 : Last Few Days for Registration. 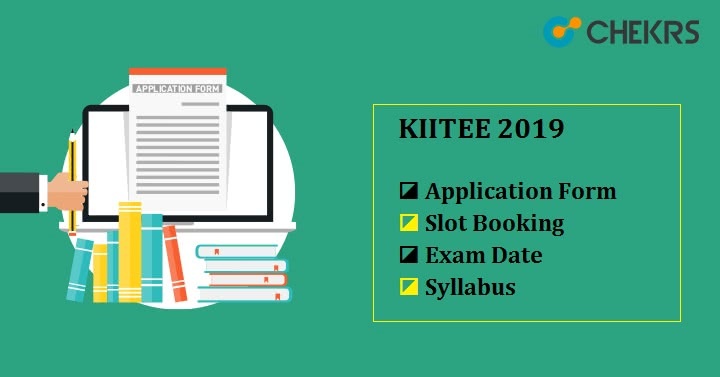 KIITEE 2019: KIIT Entrance Examination OR KIITEE is the All India Entrance Examination conducted by Kalinga Institute of Industrial Technology, Bhubaneswar. Kalinga Institute of Industrial Technology organizes KIITEE every year, to provide admission to all the eligible candidates in various UG & PG courses. Latest Update: KIITEE 2019 Slot Booking Started!! Check the link below. Latest Update: KIITEE 2019 Application Form Filling procedure started from 16th November 2018. Fill the form before 31st March. Latest Update: KIITEE 2019 Exam Date and Application form Schedule released in the notification. Check the dates Below. Latest Update: KIITEE 2019 Official Notification Announced!! Check Below. The University already listed some of the event’s dates and important details that will happen in this exam. If you want to know more about KIITEE you don’t have to wander from one place to another because All the information related to the exam has been described in this article. As we already mentioned the Kalinga Institute of Industrial Technology already listed some of the event’s dates and important details that will happen in KIITEE, so here are all the important dates and Events. Before Blindly filling the KIITEE 2019 Application Form we suggest you to please take a look at the Eligibility Criteria which will clear doubt that whether you can apply for KIITEE or not. The Eligibility Criteria for few UG & PG courses is also listed below to save your time and effort. The candidate should pass or appearing 10+2 with PCM with minimum 60% marks. Appearing candidates can also apply. The candidate should born on or after 1st July 1998. The Candidates should pass 12th with minimum 45. Candidate should not be more than 21 years aged as on 1st July 2019. Candidate should have B.Tech/B.E. or equivalent degree in the respective stream. GATE qualified applicants having score 400 or above is not necessary to appear in the KIITEE exam. Candidate should have graduation degree in any stream with 50% or above marks and mathematics as a compulsory subject at 10+2 level. Applicants should born on or after 1st July 1995. Candidate should have 10+2 passed from a recognized board with minimum 60% marks in aggregate with Mathematics as a compulsory subject. The Candidate must have NATA scorecard. Candidate should have Passed 12th in any stream with one of the compulsory subjects from Mathematics, Business, Mathematics, Economics, Statistics with at least 50% marks. Candidate must pass B.A.LLB/BBA LLB/B.Sc.LLB/B.L degree OR an equivalent degree with minimum 55% aggregate marks. After the KIITEE Eligibility Criteria here are the offered courses. 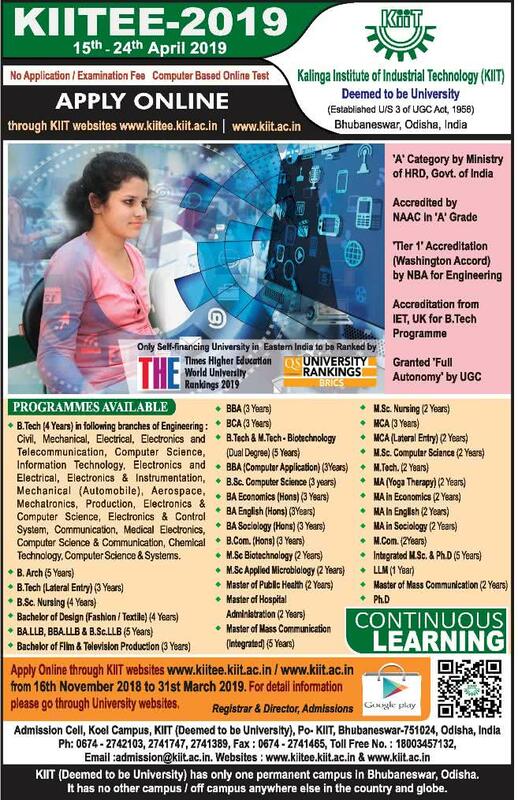 Kalinga Institute of Industrial Technology organizes KIITEE every year, to provide admission to all the eligible candidates in various UG & PG courses All of them are listed below. B.Tech, B.Tech(LE),Biotechnology-dualdegree,B.ScNursing, B.A.LL.B./BBA.LL.B./B.SC.LL.B., BBA, BCA, B.Des (Fashion/Textile), Bachelor in Film and Televisions Production, and B.Arch. M.Tech. M.Sc (Biotechnology/Applied Microbiology), M.Sc Nursing, MBA, MBA (RM), MCA, MCA (LE), Master of Mass Communication, and LL.M. The candidate can fill the KIITEE Application Form through online mode. Now, Candidates have to fill all the details carefully; candidates are not allowed to do correction after filling the Application form. Candidates have to upload their scanned image of photograph and signature, along with the copy of class 10th mark sheet. After filling the Application form All the Candidates can check their application status by entering application number. There is no application fee to be submitted for the application form. It means it is free of cost but make sure to check the Eligibility Criteria before filling the KIITEE 2019 Application form. After filling the form the candidate has to wait for the Slot booking process. Slot booking is an important part of the examinations, after submitting the application form, the candidates will be allowed to do slot booking in a limited time period. Slot booking is an Online facility, With it, the candidates can choose the exam date and timings as per their convenience on the first-come-first-serve basis. It also means that if you want to get a suitable slot of your choice, you should complete the slot booking process as early as possible. Once the KIITEE Slot Booking is done, Candidates can download the KIITEE Admit Card. For your convenience here are the basic steps to book a slot for KIITEE exams. Whenever the Slot booking facility will be opened we will provide you a direct link to that slot booking page. Just open the link and KIITEE Log in by entering details such as Application ID and Date of Birth and then click on ‘Continue’ button. Now, On the next page choose the preferable test date and select the slot. Confirm your selection. Once the slot booking is done, Candidates admit card will be available. The exam will be the computer-based test in the English language. The KIITEE 2019 Question Paper will have MCQ type questions and duration of the examination will be of 180 minutes. The candidates will get 4 marks for each correct answer and there will be negative marking of 1 mark for each wrong answer. After the Exam pattern let’s talk about the syllabus. Syllabus depends on the course and complete KIITEE Syllabus will be available probably in PDF format on the official website. For UG courses KIITEE papers will be prepared from the syllabus of the qualifying examination. The syllabus for B.Tech/ B.Arch will be set from 12th or 10+2 class syllabus. For LL.M, the KIITEE questions will be prepared from the LL.B. syllabus. For the M.Tech, question paper will be prepared from B.E./B.Tech of the respective stream. The KIITEE admit cards will be probably available in the 1st week of April 2019. It will be issued online at the official website. Once the slot booking is done, Candidates admit card will be available and they can download the admit card from there and they also can Print the KIITEE 2019 Admit card. The candidates have to carry the admit card in Examination center which will also be mentioned on the admit card with Examination dates and other details. If any candidate will unable to download their KIITEE Hall Ticket due to any technical problem or any other problem, they should contact the KIIT. As per the expected dates of exam events, the exam results will be declared in 1st week of May 2019 on the official website. All the Candidates will able to get their result by entering the application number. After the declaration of the KIITEE Results, cut-off mark will be released by the University and On the basis of obtained marks by the candidates, a separate merit list for each course will be prepared. After this, KIITEE Rank Card will be sent to the qualified candidates and they can also download the rank card from the website. As per the cut-off rank and availability of seats in different courses, the qualified Candidates, having a rank above cut-off rank, will be shortlisted for counseling. According to the Events dates, KIITEE Counseling Process is expected to start from 3rd week of May 2019. The university will publish the complete schedule for counseling after the declaration of the result. All the candidates called for counseling must bring the original documents along with token fees to the counseling center. Here is the List of documents Candidates have to bring to the counseling center. KIITEE 2019 Admit Card & Rank Card. 10th & 12th Mark sheet or Pass Certificate. For Lateral Entry Candidates Diploma Pass Certificate and three years Mark Sheet. Graduation Mark sheet and Pass Certificate, only for MCA, MCA(LE),M.Sc (Biotechnology/ Applied Microbiology). Diploma Pass Certificate and three years Mark Sheet. GATE (qualified) Score Card, for M.Tech. For M.Tech./LLM/Ph.D Candidates, Tech./B.E./ MCA/ M.Sc. or Equivalent Degree Certificate. Last but not least, Demand Draft (DD) of Rs. 75,000/-. This Demand Draft of Rs. 75,000/- also includes the counseling registration fees of Rs.10,000 in favor of KIIT, payable at Bhubaneswar. Keep in mind that the KIITEE Counseling Registration Fees of Rs.10,000 are Not Refundable. That’s It guys, If you want a bright future in any of the above fields then you can apply for the KIITEE examination. But make sure to stay updated about this Examination through following our website, And Don’t Forget to fill the KIITEE 2019 Application Form on or before the last date of the application process.